As our lives became more global, more and more people are finding themselves living, working and owning property and assets in different locations. However, with that has come significant complexities when it comes to an individual’s tax position. Whether you are coming to the UK, considering an investment here, or you are based in the UK and considering investing abroad, or you or a family member is moving from the UK to go overseas temporarily or permanently, you will need advice on your tax position. Whilst the UK has many advantages for people coming to or investing in the UK it also has the longest tax code in the world that runs to over 17,000 pages. It is important that you prepare for your move to the UK well in advance of your arrival, as there are significant tax advantages available if you structure your affairs properly. Once you are UK resident, even bringing money into the UK may trigger UK tax charge. So it is important to seek advice and not assume that UK tax laws will reflect those you may be used to from other jurisdictions. This is particularly true for US citizens who will remain exposed to the US tax system. We work with the globally wealthy to ensure that you are fully appraised of the implications of your position and can take the appropriate action. That may be to ensure that you are fully compliant with all the rapidly updating anti-avoidance legislation or it may simply be about structuring your ownership with a view to looking after your family. UK, and London property in particular, is a hugely attractive asset class for investors. Historically, UK residential property has been acquired through non-UK trusts or companies so that the UK home becomes a non-UK asset and does not form part of your estate chargeable to Inheritance Tax (IHT). These charges apply whether the ultimate owner is resident in the UK or not. However, it is no longer possible to shelter UK residential property in this way so specific planning advice should be sought if you are considering investing in the UK to minimise the potential tax burden. The new tax rules are complex and can trigger double IHT charges on the same economic value of UK property. There are also filing obligations and annual tax charges where property is held through a company..
Commercial property will be brought into this regime from 6 April 2020. Where landlords rent out UK property but spend more than half the year living overseas, strict rules now apply that attract tax penalties if your tax position is not fully compliant. You should seek advice particularly if you are looking to develop the property. You will also need to register with HMRC’s Non-Resident Landlord Scheme within 30 days of any tenancy beginning. The UK is an attractive destination for the globally wealthy due to the non domiciled regime. This applies to individuals resident in the UK but who are not domiciled here. This usually applies to individuals who come to the UK from abroad and where their family has had no historical connection to the UK. Where this regime applies an individual will be taxed solely on income and gains realised in the UK but only on offshore income and gains brought to the UK. This regime applies where someone has been resident for fewer than 15 out of 20 years of residence, although the benefits of the regime can be extended beyond that period with careful planning. Pre-arrival tax planning allow the globally wealthy to live in the UK for a number of years without any UK tax liabilities at all. You will need advice on structuring bank accounts, how to access funds in the UK, and possibly the creation of trust or other offshore structures to hold assets. You will also need advice on the purchase of any UK properties. It is also possible to invest in a UK trading company with funds that would otherwise trigger a tax charge using business investment relief. Our offering to the globally wealthy is a holistic approach incorporating tax efficiency, flexibility and simplicity, whilst planning for their own and their families' current and likely future economic and social needs. Helping individuals register for tax in the UK. Advising on the tax implications of UK employments. 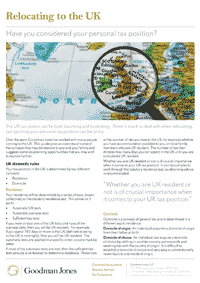 Transferring pension schemes on leaving the UK. Advice on Business Investment Relief. The first step in understanding your UK tax position is to understand whether HMRC considers that you are resident or domiciled. Establishing this can be complex and complicated and yet it is fundamental to how you are taxed. We work with many globally wealthy individuals and families and can guide you through the different implications so that you can take informed decisions about your time in the UK and how you want to manage your UK assets. There are plenty of enticing places to invest in property whether as a holiday home or simply an investment. However with it come complexities that can have significant tax implications such as tax on any rent, capital gains tax and inheritance tax. It is important to take advice on the tax implications as well as legal implications and review your will when you purchase a property overseas. Each case requires an individual approach to ensure that it is right for you and your family. Offshore structuring has come in for a lot of attention recently but many commentators fell into the trap of equating all offshore investment with tax avoidance by the wealthy. But offshore investment has a much wider and often less tax-driven appeal. For example the main reason for using offshore trusts and foundations is asset protection for and from the beneficiaries. They can be used whether the investment is an investment or trading company. Trusts in general are vehicles which may be used successfully where asset protection and a degree of control is wanted and are not tax mitigation structures. In many cases, the tax and admin burden may be higher than holding the tax personally where the settlor is UK domiciled and resident. However, an offshore trust can still offer tax mitigation for non tax domiciled individuals under certain circumstance, giving protection from IHT on foreign sited assets and potentially UK assets, (as long the value isn’t derived from UK residential property). It is also possible to defer UK Capital Gains Tax (CGT) and since April 2017 there can be certain income tax benefits as well. This is an extremely complicated area with as many pitfalls and traps as there are potential advantages and UK tax rules are continuing to be tightened up in this area. It is very important that proper, detailed advice is taken. We have experience in guiding wealthy individuals and their families, whether beneficiaries, settlors or trustees through the complexities of issues such as the disclosures demanded and the various registration requirements. As part of GMN International, we are also able to coordinate with colleagues in other jurisdictions to benefit from local knowledge and expertise. Double Taxation Treaties (DTTs) are essentially designed to ensure that no-one pays double tax on a source of income or a capital gain. Every country has its own domestic rules on residency and on how they tax sources of income or capital gains. DTTs are a document between two countries essentially agreeing who has the primary right to tax a source of income or gains and also sets out rules for giving credit for tax paid in one jurisdiction against tax paid in another. Generally, the country in which and individual is resident has the primary right, but it is possible to be resident in both countries under their own domestic rules and a DTT therefore also has rules to determine which country should be viewed as the place of residence of an individual or entity. DTTs are very useful but they are not uniform and vary between countries. The recent treaties have more anti-avoidance measures. Assumptions certainly should not be made. You need to be aware of how they apply to your own specific situation. We can liaise with our GMN network to determine the most tax efficient structure for conducting business in another jurisdiction. You may simply want to avoid creating a tax base in the country, or you may be considering a branch, a subsidiary or an independent company. We can advise on any and all of these structures. You need to notify HMRC if you are leaving the UK to live abroad permanently or working abroad for at least one full tax year. You may be entitled to a tax refund if you leave part way through the year. You may also trigger exit tax charges on entities if your departure affects their tax residence status, and so this is something to consider carefully. Helping a son understand the implications of the potential ties to the UK following the death of his father. Advising a married couple on their residence status. Helping a company director understand his tax position in the UK and future tax planning. Advising a family on ceasing residence in the UK and how this will affect their tax liability on realising a capital gain and receiving a large dividend.